Usually Noodler's X-Feather is so good at resisting feathering, I could write on a run-of-the-mill paper napkin with it using my Rotring 400 pen with an EF nib, and it would barely show any feathering; furthermore, soaking said paper napkin afterwards still would not induce feathering. 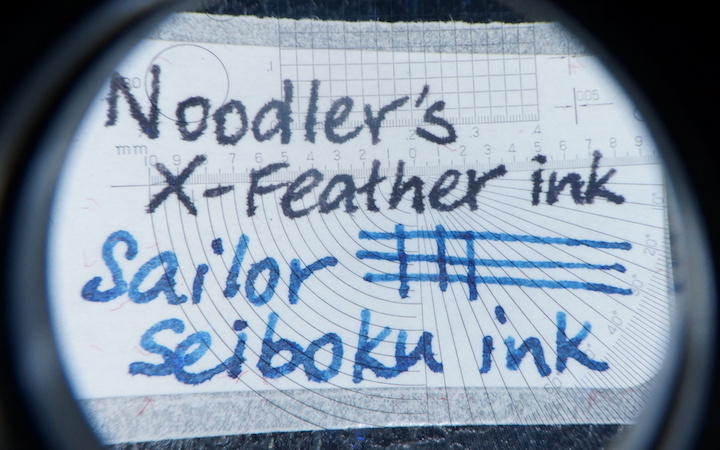 Imagine my surprise to see writing done with that pen and ink feather earlier tonight, especially when Sailor seiboku does not appear to feather on the same paper to anywhere near the same degree. Wonder if it's the thickness of the paper with the adhesive behind it, and with X-feather sitting on top, whatever did penetrate blow it, radiated outward thru the stray filaments, whereas the sailor just radiated down and out right off the bat. That'd be my guess on it. Inkjet labels are for inkjet printers . . . and ballpoints. It is possible that Avery uses the same type of paper for its inkjet labels, but this narrow roll of labels I'm using is definitely not for inserting into any (consumer market) printer I know of for printing. Moleskine is only meant for Pencils and ballpoints and not Rollerballs or Fountain pens (their words), but yet people still using it. xfeather will feather on a lot of different stuff. I honestly found it pretty unremarkable, feathering wise. If feathering/bleeding is absolutely not allowable, the only ink I know of that pretty much cannot and will not feather or bleed is diamine registrar's iron gall.